When you talk, don’t say anything bad. But say the good things that people need—whatever will help them grow stronger. 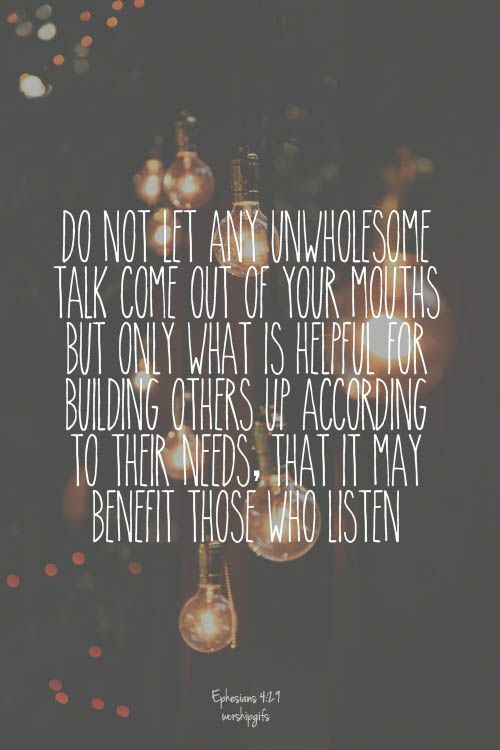 Then what you say will be a blessing to those who hear you. 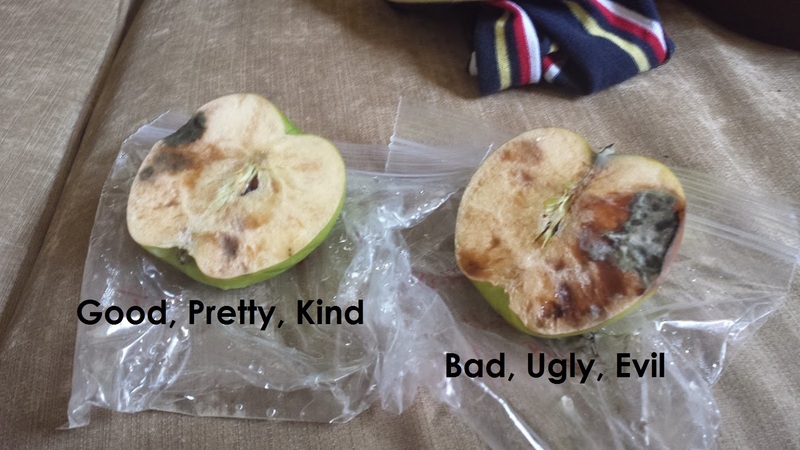 I put one half of an apple in a ziplock bag where I had written words like ‘good, pretty, kind.’ The other half of the apple went in a bag with words like ‘bad, ugly, evil’ on it. I put the baggies on the window sill next to our kitchen sink. Any time I looked over at them I tried to remember to talk negatively/positively to them. But I was worried that the apples would get confused on who I was talking to and pick up unintended messages thus destroying the integrity of this very scientific science experiment. This went on for a few days because I have the attention span of a gnat and the patience of not-a-grasshopper. The apples didn’t look different immediately so I got bored. I let the apples hang out on the window, but I was pretty sure nothing was going to happen. Actually, so little was happening that I even considered turning the experiment into the one everyone does with french fries to show that they don’t mold so we shouldn’t eat them and was going to point out apples don’t rot either so ha! Out of nowhere Bad Apple seemed to rot overnight. I mean, Good Apple wasn’t looking amazing, but she would definitely beat Bad Apple in the Putnam County Fairest of the Fair Apple Division. I’m digging the idea that our words and thoughts matter. But what I thought was most interesting was that the words and thoughts didn’t do anything to the apples immediately. It wasn’t like I talked crap and the Bad Apple got a bruise. Because there aren’t immediate effects it makes it so much easier let critical and negative words out. I mean, it’d be a lot easier to be careful with how I talk to Mark if he got a black eye every time I pointed out all the ways he’d let me down that day. I don’t actually think we need an almost science experiment to know that we should use good words. Think good thoughts. Build each other up. Be thankful for each other. Be gracious towards yourself and others. But the apples are a helpful reminder that our words and thoughts have power even if we can’t see their impact immediately. Kind words are like a life-giving tree, but lying words will crush your spirit. Absolutely love this! If you want more info on this topic, check out the documentary “I Am” on Netflix. Fascinating!! !